We all know the the olive tree supplies us with healthful olives during harvest but it is equally important in the simple everyday moments of the growing season. 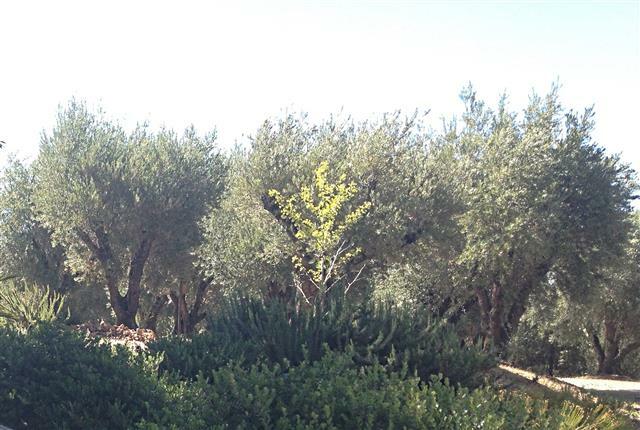 There is something very peaceful about a well maintained traditional olive orchard. Italian landscape architect, Alice Collantoni, says that olive trees have become the most requested tree for her country home designs. They are evergreens that provide shade all year long that require comparatively little maintenance. Their gnarled trunks seem to echo our own lives where we convert our daily struggles into a healthy beauty. We connect to the olive tree because it gives us so much in all areas of life and asks for very little. Experiencing the beauty of the olive tree is one of the many reasons why we love what we do. Below is a small olive grove in the background used within a California xeriscape with manzanita, rosemary, and a ginko tree in the foreground.